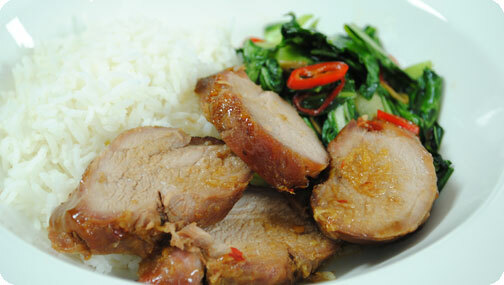 Char Sui BBQ Pork and Stir Fried Asian Greens – 566kcals and 13.4g of fat per serving. Using a sharp knife, make slashes along the pork fillet. Starting with the spring onions and ginger combine all the remaining ingredients in a pestle and mortar and marinade the pork for 2-3 hours, or overnight if you can. Pre-heat the oven to 200C. Drain the pork from its marinade and place on a rack set over a roasting tin half-filled with hot water. Cook the pork for about 25 minutes - after 15 minutes, turn the meat over so it colours on all sides. Baste regularly with the extra marinade left behind in the bowl. Heat the groundnut oil in a wok and stir fry the garlic and chilli for 30 seconds. Add the greens and stir fry until they begin to wilt. Take off the heat and add the oyster sauce.